This being my first official blogpost as a member of Tristania, I would first direct my humble gratitude to the band, and to all you readers, listeners, fans! I have loved my time in Tristania so far, and we’re just getting started. Thanks for all the nice emails and all the support! Well, enough smooth talk, let’s get down to business! We have a new record in the making, as some of you might be aware of. The songs are mainly done, the lyrics are getting there, and recording dates are to be booked soon. The creation of this album has been for me personally the most exciting and exhausting task I have ever embarked on. 13 ideas are slowly but steadily growing into 13 brand new songs. From idea to draft to sketch to demo to pre-prod, and soon, to the new Tristania album. When I joined the band, they told me that the creative process was a collective effort. My opinions and ideas would count just as much as the people that has been in the band a decade or more. To some it may seem ridiculous to “jeopardise” the most important aspect in the band, the songwriting, by inviting someone completely fresh to participate. Even if we had very different musical background and preferences, Anders took the initiative to find the common ground, and create new music, and after working together with Anders only a couple of sessions, it was clear to me that we had much more in common musically, than our background would indicate. I was actually stoked in the beginning, that they would let me into the songwriting process. I didn’t have much experience as a songwriter, and very little to show for. This is probably where I am the most grateful. That Anders from the beginning encouraged me to write, and always made me feel that my ideas were, even if the earliest ones were rather immature, welcomed, and were considered seriously. Now, thousands of working hours, hundreds of ideas, dozens of half songs and drafts and 13 brand new Tristania songs later, what I am really proud of, is that we have lived up to the most important principal in Tristania’s music ever. That principal is not a certain mood, guitar sound, vocal style or lyrical content, but the fact that Tristania’s music changes according to our hearts, it grows with the band. What you will hear on next year’s album is the accurate sound of where Tristania is NOW. We have an amazing blend, where all seven members have contributed creatively. Still it sounds like Tristania, which means it doesn’t sound like anything else, in my ears! Remember how World of Glass sounded fresh and different, and maybe a little strange, after Widow´s Weeds and Beyond the Veil? World of Glass quickly established itself as a natural part of the Tristanian sound. The same thing happened with both Ashes and Illumination. To some, they maybe didn’t sound like “Tristania” immediately, but now they are a natural part ofthe band’s history and sound. My point is, the music that is going to be released in the near future from Tristania, is not going to sound like “Tristania” immediately. But it will sound like the sum of all the members of Tristania now. And I dare to bet that it will find it’s very natural place in Tristania’s great and diverse discography. Just like all the other albums. This is, like I said the single most important principal. 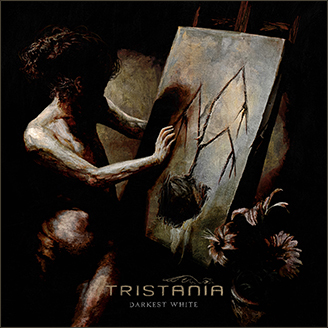 Tristania creates music from the heart, and not from an idea of what Tristania is. All this being said, I can’t wait to let you hear the music. It’s tiring to write about music. Just as when I read a review or an article about music, I want to HEAR it. It’s more or less the same when I write about music. I want to PLAY if to you! Until next time, have a good time! This entry was posted in News and tagged album, lyrics, music, ole, tristania. Bookmark the permalink.